For increasing our Adsense revenue we always put ads in the Header of our blog, Footer of the blog, and also we put banner ads in the sidebar. These are the places where a user can easily ignore your ads. because he only wants your posts which is in the bottom and very neat and clean. because there are no ads. Having no ads in the posts is the very good thing but if we want to increase our AdSense revenue is we have to put ads between the posts because this is the only place where a user cannot ignore and your ad will attract more and more users and the click will also increase. Basically, the fact is that if you want to increase your earning then you have to sacrifice with your content neatness. and it is not a serious issue everyone is putting ads in the content. But for the quality and neatness of the content, we can add a single ad in a post or two ads in a post which is good. So today in this post I going to introduce you a WordPress Plugin which will make it easier for you to place Ads in between your Content. Now we start step by step. Step:1 First you have to log in your WordPress as Admin. and install a plugin which called Insert Post Ads. If you don’t know How To Install A WordPress Plugin? Step:2 I hope you have successfully installed the plugin. Now you can see the Post Adverts section after the pages as shown in the below image. Click On settings. Step:3 Make sure on the settings page the Posts and Pages in checked already if it is not checked then checked it both. Leave Exclude CSS blank if you don,t know about it. Step:4 Now create a new advert. so click Post Advert>Add New. You can see two fields where first is asking about Advert title you can give any title which is rememberable for you. and the second field is asking Advert code where you have to paste your ad code which you can easily get from AdSense or network you are using. I am going to copy my AdSense ad code. Step:5 Now I have my ad code and I write my advert title 5th para Ad. Because I am going to place it after 5th paragraph of every my blog post. In the image, you can see the Display the Advert there is three option first Before content, second is After Paragraph number and the last is after content. if you want to add your ad in the post you choose the second option then fill the number as shown in the image. and click on Publish to make your ad live. Step:6 I have tested and it is working fine. You can also test it. you can see it is placed after 5th paragraph. How can I block ads in a specific post? 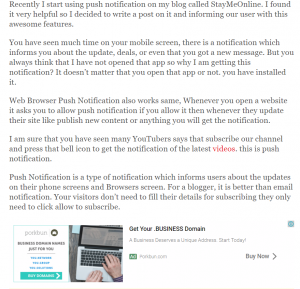 If You will use Insert post ads plugin for adding ads in the post. You can easily block or disable ads on any particular or specific post. There will an option to disable adverts in your post editor page just tick that box then ad will not be displayed in that single post. Hi nice your good work. hello. it helps to earn some extra money if our blogging site rank good. Sir Please Suggest Me How To Rank MY Blog In Google First PAGE. Google Loves to Optimize content. Make your content SEO friendly. make your images SEO friendly. Increase traffic then you will be reached at rank 1st. I will be writing a post about it very soon keep visiting. thanks for sharing this information ! it helps me alot for my wordpress website.